After former Chief Superintendent David Duckenfield completed his evidence to the new inquests into the 96 Liverpool fans who lost their lives in the Hillsborough stadium disaster of 1989, we have been subjected not to the measured comment of those who want to respect the inquest process, but to the background moaning sound of a former Sun editor still trying to pretend that he was a blameless bystander. Yes, Kelvin MacKenzie (for it was he) has once again taken to the pulpit provided for him by Creepy Uncle Rupe to tell the world that Everyone Else Did It, Honestly. 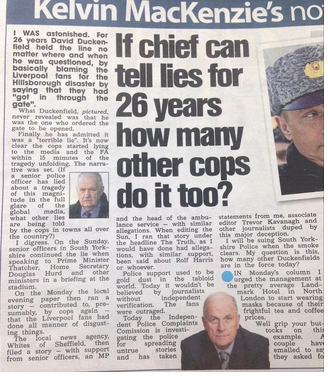 “If chief can tell lies for 26 years how many other cops do it too?” howled the headline. And, as Jon Stewart might have said, two things here. One, Duckenfield hasn’t “lied for 26 years”. And two, Kel wasn’t so fussed about that aspect at the time. But let’s hear some more from The Great Man: “On the Sunday [day after the disaster], senior officers in South Yorkshire continued the lie when speaking to Prime Minister [Margaret] Thatcher, Home Secretary Douglas Hurd and other ministers in a briefing at the stadium … On the Monday the local evening paper ran a story - contributed to, presumably, by cops again - that the Liverpool fans had done all manner of disgusting things”. And then he slips in the big spinner. “The local news agency, Whites of Sheffield, then filed a story - with support from senior officers, an MP and the head of the ambulance services - with similar allegations. When editing the Sun, I ran that story with the headline The Truth, as I would have done had allegations, with similar support, been said about Rolf Harris or whoever”. Kel declares that he was “duped by this major deception … I will be suing South Yorkshire Police when the smoke clears”. That’s most creative of him. It’s true that the Sun was not the only title running the allegations disseminated via White’s, but, as Alex Hern at the Staggers pointed out in 2012, the likes of the Express stressed that they were just that. It was the Sun that crossed the line to asserting the allegations were “The Truth”. 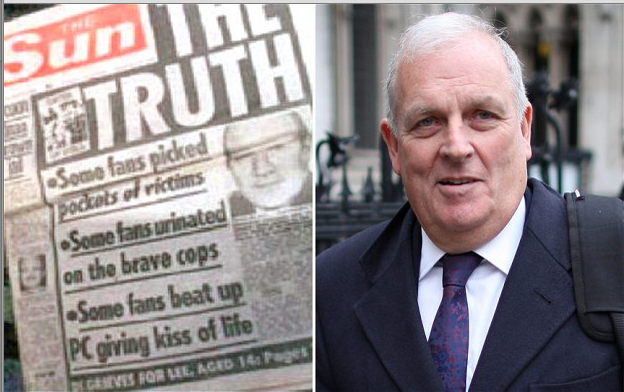 The History Of The Sun recalls what happened as Kel put his headline together: “As MacKenzie's layout was seen by more and more people, a collective shudder ran through the office (but) MacKenzie's dominance was so total there was nobody left in the organisation who could rein him in except Murdoch … The error staring them in the face was too glaring. It obviously wasn't a silly mistake; nor was it a simple oversight. Nobody really had any comment on it—they just took one look and went away shaking their heads in wonder at the enormity of it. It was a 'classic smear’”. Then, despite the mounting tide of evidence to show that Kel had been plain flat wrong, he continued to claim that he had been right all along; he only apologised because Rupe made him. He and his paper had countless opportunities to withdraw and apologise. They took none of them. So, now that yet another figure from the time owns up, he bleats that he is a victim and it’s somebody else’s fault. He isn’t. And it’s not. Kelvin McFilth was the master of his own destiny, and architect of his own downfall. Nobody else featured, or was allowed to. He can take responsibility for his own actions. This doesn't surprise me at all. I once spent an evening sitting at a restaurant table next to his. I've never come across a more arrogant man. Totally full of himself. I still regret that I never took him to task over Hillsborough but he was entertaining guests and, at the time, I thought better of it. And, by the way, he still doesn't understand why a lot of people in Liverpool don't buy the Sun.